I first met Chris about almost a year ago, in May of 2015. A month or two into our training together, we were talking about what she did for her workouts on her day off. The answer was “nothing”. She was starting to do some jogging on the treadmill before our sessions and she seemed to like it, so I asked if she would ever consider doing a 5k run. The thought of that scared her so much she couldn’t even say it out loud. A week or two later she informed me that she had registered for her first 5k run! She has now done a couple and is training to do a sub-30 minute 5k this summer. Chris has come a long way in a short period of time. 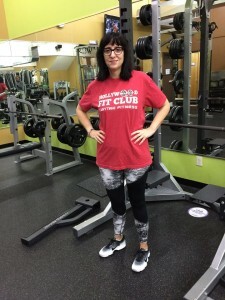 She used to doubt her ability, was scared do much exercise on her own, and now she looks forward to coming to the gym and is constantly crushing her strength PRs. Why did you join Anytime Fitness? I jo ined Anytime Fitness two years ago because I felt bloated and unhealthy. What positive results have you seen from your workout so far? I not only feel stronger, I have more self confidence. I have changed how I eat completely. It has changed my life. What is your typical regimen for exercising, days per week, and length of time per day? I work out typically Monday through Friday. Tuesday and Thursday with Jessica my trainer. I get up at 4:00am and I’m to the gym by 4:30. It makes my day so much better to work out before I go to work. What is your favorite exercise or piece of equipment? I really like the TRX. It is hard, but gets results. What are your future fitness goals? I’d like to be able to do a 5k in thirty minutes. Are you married/single, have kids, have pets? I am married and I have three kids, two cats and a dog. What is your favorite cheat food? I love cake! You just can’t be sad when you’re eating cake! What advice can you give to new members just starting out? Don’t give up. Some days you won’t feel like working out. You may have gained a few pounds, and you may be discouraged. Don’t give up!!! I ran my first 5k at 49 years old, and I had never done anything like that before. If I can do it, anyone can.